"Family Flight" first aired on Oct. 25, 1972, on ABC. It's a show full of drama, life-and-death perils and family tensions. Jason Carlyle is a pilot and former Navy man. 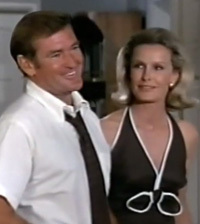 His son, David (Kristoffer Tabori), has unexpectedly returned home after a long estrangement during which Jason's wife, Florence (Dina Merrill), has quietly become an alcoholic. Taylor gives a fine performance as the tough-minded, hard-bodied service veteran who puts his survivalist training to good use. He gets his fragile group working together, battling hunger, thirst -- and the clock -- to clear a take-off strip and repair the airplane. The TV movie carries the viewer through ups and downs of successes, celebrations, catastrophes and conflict. And the suspense doesn't end until the airplane comes down for a second time. The show was directed by Marvin Chomsky, who later directed Taylor in "A Matter of Wife ... and Death." Chomsky is notable for being the director of the landmark mini-series "Roots" and "Holocaust." Rod is an Aussie; he's a great guy, he knew his lines, he knew his character. ... He was very craftsman-like to the core ... He was a movie star and everyone looked up to him. You can tell the ones who came up through the studio system. I thought he was one of the greatest guys -- a great actor, pleasant and funny, created a great environment on set. ... For a young actor like myself it was very good to be around a guy like that, you see how to behave. ... He was a better actor than he's ever been given credit for. I think a lot of it is because he was so attractive and had the leading man musculature look, he kept getting diminished as a hunk. But he was a really good actor and funny. Tabori praises a scene in which Rod's character is injured by a propeller. I was watching him going, 'God this is good acting.' He's taking this material which isn't particularly engaging and giving it complexity and life -- making the father complex and engaging. 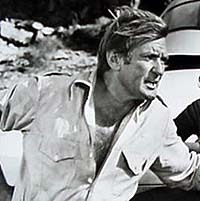 -- Rod Taylor: An Aussie in Hollywood. Another star of "Family Flight" was a rugged little airplane called a Navion, and I've learned that Navions have quite a following of their own. One enthusiast wrote, "They are tough and forgiving and just want to fly." Based on that description, I'd say the one in "Family Flight" gives a very realistic performance!